The second half of the Shakespeare Theatre Company's Hero/Traitor rep has opened with Michael Kahn's production of Wallenstein, in a new translation/adaptation by Robert Pinksy. Rather than the reductive Leadership Rep of a few seasons past (which oversimplified productions of Richard II and Henry V into Bad King/Good King), the Hero/Traitor Rep embraces two titular characters who embody both sides of this dynamic. As an audience, it's fascinating to watch the way Wallenstein and Coriolanus struggle with public perception, ambition, and power in war. Our blogger Emma has covered Coriolanus here; this review will focus on Wallenstein. Originally a trilogy of plays by Friedrich Schiller, Pinsky's adaptation focuses on the final stages of Wallenstein's fall. It's not a spoiler- our first introduction to this world comes in a murkily-lit underworld inhabited by fallen soldiers and our hero- Wallenstein, leader of men, ruler of board games. There's a lovely moment at the top of the play where the fears of the audience (who fret about not having done their homework, who knows anything about Schiller, has anybody Wikipedia'd this guy and want to share?) are addressed and dismissed- so long as the audience is willing to pay attention as the players are introduced and get on board for some political machination on a subject they likely have little previous knowledge about, they'll do just fine. 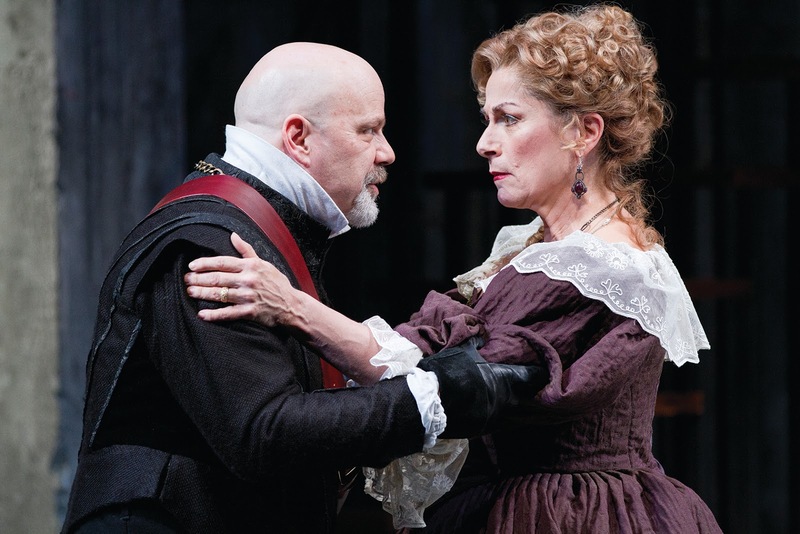 Steve Pickering as Wallenstein and Diane D’Aquila as Countess Czerny in the Shakespeare Theatre Company's production of Wallenstein, directed by Michael Kahn. Photo by Scott Suchman. Steve Pickering is fascinating as Wallenstein, with a rugged charisma and a knowing eye that encompasses both his men and the audience, whom he frequently addresses in these strange returns to the underworld that appear after major scenes (it's a strange, Brechtian mechanism to encounter here in an evening that's meant to be dedicated to Schiller, and I'm not sure how often it actually helps to see the cast swaying like seasick sailors in a green light). The play truly rests on his shoulders, and he does a masterful job at carrying that weight without showing the labor it must take. Confession time- my attention drifted at a few points early in the evening. I jerked it back and realized that I had just missed a crucial conversation- Wallenstein, beloved hero of his soldiers and a vital servant of his emperor, was supposedly in talks with Sweden, the enemy. Wait- what? I actually missed the moment (I think) when Wallenstein explained his motivations and his goal. Now, shame on me. I welcome your criticism and chastisement. BUT. I mention this not because I'm a glutton for shame, but because it became a fascinating way to experience the play. Wallenstein is constantly engaged in theatre of his own creation- he plays a different character to different men, and he gives everyone a slightly different spin on his story. Watching those performances and trying to piece together a "true" version of events? An unexpected, unintended way to experience this play, but one that turned into a unique theatrical event in my own seat in Sidney Harman Hall. The supporting cast to Pickering's Wallenstein is quite good. I loved Derrick Lee Weeden's Kolibas as one of Wallenstein's most important supporters, and Diane D'Aquila was a fascinating presence every time she walked on stage as the Countess; both of these actors left me wanting more when they exited a scene. I wish I were more impressed by Nick Dillenburg, an actor I've enjoyed in the past- there was a stiffness to his acting that left me thinking he was focusing on balancing his (deeply sad looking) wig on top of his head, to the detriment of his acting. Dillenburg also seemed to stumble with the formality of Pinsky's translation at times, a problem I saw in a number of scenes with various cast members- depending on the scene, the language could veer from simple and modern to stilted and unwieldy. I sometimes felt like I had a slight case of tonal vertigo that had its root cause in the translation, which was an unfortunate side effect of the production. Wallenstein is well directed, well acted, shinily produced and snazzily designed. It never quite grabbed me, however- I was intellectually intrigued by the questions being posed, but the production didn't manage to move me beyond that curiosity. I'm so excited every time STC announces a repertory in its season, because there's so much to be gained by programming in this way; repertories succeed when we get to see two brilliant plays in strong productions bouncing off of each other in ways that would never occur to an audience without the benefit of seeing both. I'm pleased with this Wallenstein as part of the Hero/Traitor repertory, but I'm not sure how well I would like it on its own. But hey- that's the point of a rep! See both! Talk about both! And let the next guys figure out what to do with Pinsky's adaptation.